Usually $380.00 for size 6+8+10 to serve 65 guests. Slashed Down to $370.00 . Or larger size 6+9+12 inch to serve 90 guests, usually $430.00 Slashed Down to $420.00. These are nice deep cakes and you can have a lovely filling inside each cake. Fresh flowers in a colour of your choice. Fairy Usually $40.00 Slashed Down to $35.00 if placing your order in February. 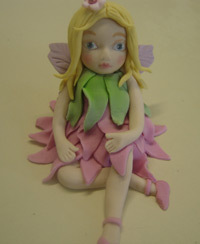 Fondant cake topper Fairy to sit on your own cake. She can be made in colours and hair style to suit what you would like. She keeps well for a long time if stored in a dry area, not in a fridge. There is a tooth pick inside her body for strength. A special topper for your special wee girl. 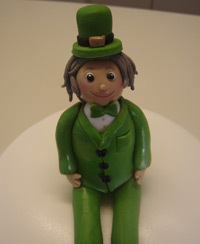 Irish cake topper to sit on your own cake. Great for all those Irish celebrations coming up. This topper is made from fondant and has a tooth pick inserted inside him for strength. The hair colour can be changed to what you would like. Keeps well for a long time if stored in a dry area, not a fridge. Irish Man was $40.00 Slashed Down to $35.00 if placing your order in February. 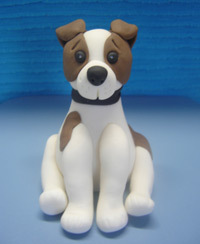 Dog cake topper to sit on your own cake. Made of fondant icing and has a tooth pick inserted in it’s body for strength. The style and colour can be changed to look a little like your own dog. Keeps well for a long time if stored in a dry area, not in a fridge. These prices are for orders placed in the month of February 2019. Your cake order can be created for later in the year, for when you need it. You must place the order in February 2019 to get the discount special. 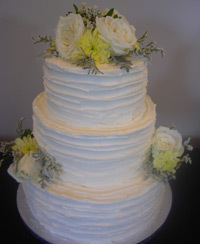 3 Tier Fresh Flower Delight Cake. Your orders must be placed in current month. For the wedding cakes, your weddings must be from the 1st of current month or after this date. Also you will need to let me know what date your wedding is so that I can check on availability for your wedding date. First in first served so make your bookings early so that you don’t miss out if i get booked up.